If you want to track phone calls generated by your website using ResponseTap (formerly AdInsight) then you’re likely to come across an annoying issue with the way call data is sent to Google Analytics; ResponseTap sends different values from those usually found in Google Analytics. Here’s a solution to get ResponseTap call tracking playing nicely with Google Analytics. Once you’ve set up ResponseTap to send call data to Google Analytics, you’ll notice some of the source and medium values that are sent from ResponseTap differ from the usual values in Google Analytics. Instead of “google/cpc” ResponseTap sends “Google/PPC” (note the capitalisation). This difference in capitalisation (and sometimes word!) means that Google Analytics logs these as separate activities making reporting very fiddly, time consuming and potentially misleading. Note that in Fig 1 (above), items 1 and 2 are the same so the fact that they’re reported separately is not ideal. The same is true of items 3 & 4 and 5 & 6. I’ve spoken to ResponseTap support a couple of times and they were very nice but essentially said “that’s the way it is” (…because that’s what Google make us do). Hurrumph! I suggest you create a new profile in your GA account and call it something like ‘RT cleaned data’. By creating a new profile you can keep your ‘unfiltered’ data untouched in case you make a mistake etc. In the ‘RT cleaned data’ profile you’re going to create a number of filters to process the data sent from ResponseTap and rewrite it to match the values used by Google Analytics. So, all we need to do is create a filter to rewrite each of these to the ‘native’ value and all future GA data/reporting will be correct. 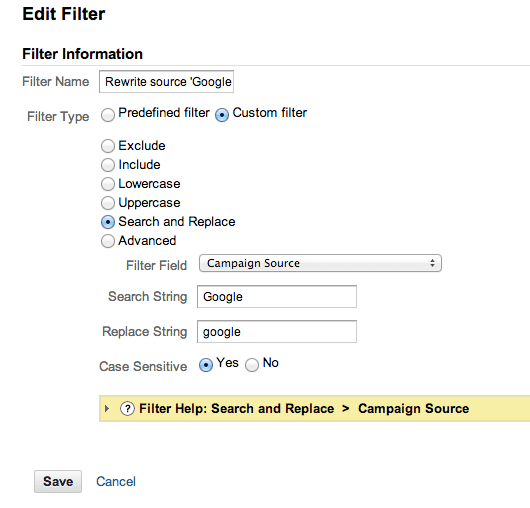 The only thing that’s not obvious when creating the filter is that you need to select “campaign source” from the “filter field” drop down. When you create the filters to fix the “medium” values you’ll need to select “campaign medium”. Other than that, setting up each of the filters should be straightforward. If you want to track phone calls generated by your website or want to make sure Google Analytics is set up correctly, get in touch for some digital marketing advice from The ePro.